The Justice Department is the huge, sprawling organization that governs and regulates the lives of every citizen within Mega-City One. 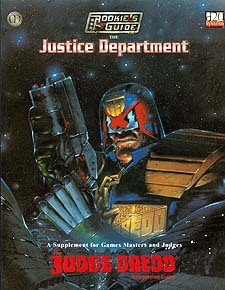 The judges on the street are merely the most visible portion of this gigantic administrative body and though the maintaining of Law and order is paramount, the Justice Department also controls or monitors all governmental bodies within Mega-City One, ensuring every citizen is provided for and protected from enemies both within and without. Every judge on the street is far more than a well-trained individual committed to upholding the Law. He also has the entire weight of the Justice Department behind him, and can call upon its resources throughout his career. With this authority comes a terrible responsibility, for a judge is sworn to protect every citizen from harm. Organization: Learn how the massive structure of the Justice Department is able to combine its resources to fight any threat to Mega-City One. Specialist Judges: Train hard and specialize your character to join the Ace-Div, Heavy Weapons Squad, Holocaust Squad, Pursuit Squad or attain the rank of Sector Chief. Clones and Bloodlines: To fight escalating crime levels, many judges are cloned from individuals who have distinguished themselves in the line of duty. Judge characters can now use bloodlines from such personalities as Farfgo and Solomon. Back Up and Sector House Resources: A judge never has to work alone on the streets - call upon the massive resource of the Justice Department and get the help of Bomb Squads, Credit Squads, the Dream Police and many more. Justice Department Weaponry: There are times when even a Mk II Lawgiver won't do. Learn how to use the Widowmaker, Clearcoast Wall Gun, Urban Nuke and dreaded TAD. Special Issue Equipment: In order to aid investigations, the Justice Department has a massive amount of specialized equipment judges may requisition, such as the Long Ear surveillance device, Dream Machine and Tracer Dart. Vehicles and Robots: The Manta Prowl Tank was just the beginning - now the Justice Department can count on the awesome might of the Omni Tank, S-Wagon and Mechanismo robots. Locations: Includes full details on the most important Justice-Department owned landmarks of Mega-City One. Sector House 190: A completely detailed Sector House, ready to be used in any campaign.